Older women have never been so visible, or so problematised, in popular media culture as now, but what kinds of representations are being offered and how can we make sense of them in the context of post-feminism and global economic change? 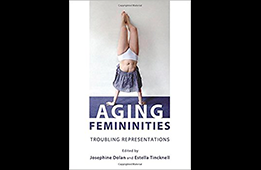 Edited by Josephine Dolan and Estella Tincknell, Aging Femininities: Troubling Representations offers a timely intervention into the hiatus between the visibility of aging femininity in contemporary circuits of culture and its marginalisation in cultural theory. From graceful agers and Saga subscribers, to make-over models and pop divas, each of the essays in this collection interrogates the different manifestations of aging femininity in terms both of its historic invisibility and its new visibility. The book forges links between contemporary lived experience and feminist cultural theory and research, often through the direct and autobiographical knowledge of the writers themselves. Divided into four sections – Cultural Herstories, Regulations and Transgressions, Problematic Postfeminists? and Divas and Dolls – plus a thought-provoking photo essay, it wrests the discourse of aging away from the twin hegemonies of consumer culture and gerontology to present a diverse selection of essays and positions. Aging Femininities: Troubling Representations establishes the long overlooked richness and the complexity of this field of study.